Tany's Dell Community Primary School strives to provide their pupils with a high standard of education in order to fully prepare them for their next stage of learning, and to instil in them a love of learning. They renewed their flexible ICT support service with RM Education again in July 2015. 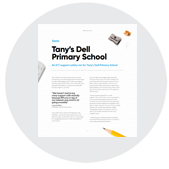 Tany's Dell Primary School's Site Manager, Andy McWilliam, has the job of ensuring the security of staff and pupils. As part of this role, he is responsible for managing the provision of safe and reliable ICT to the school. Andy has been Site Manager at the school for 23 years and has seen some of the children who were there when he first started, return to Tany's Dell as either student teachers, LSAs or mums and dads themselves (including his children and grandchildren!) so he has the needs of the school very much at heart, and trusts his ICT support to RM Education. "I'm very pleased with the way our support service works. RM provide us with an ICT safety net and it's seamless. We have onsite support from our RM engineer, Vince, who visits us once a fortnight. He is very accommodating and resolves the more complex issues or any that need to be addressed physically in school. Between our engineer visits, I log my support requests online as it's easy, and RM responds very quickly with a friendly update. We get great support on the phone, and they dial in via a remote connection for the more in-depth issues. We haven't had to log many support calls recently because RM are on top of our network now and it's all going smoothly. I spend my day troubleshooting so it's great to know that RM is keeping an eye on our network with the Remote Proactive Checks. I don't have to worry that our backups have worked or our systems are secure."